When sitting down to write your resume, there are a few key things to keep in mind. Here are the essentials that you MUST include in your resume if want to present a polished, professional look. This goes without saying… but oddly enough people forget to include contact information to the resume on a regular basis. Obviously, this significantly hinders your ability to get an interview. Make sure your name is large enough to stand out, but not obnoxiously large, and that you at least include your phone number and email address. Street addresses are becoming less common but typically city and state is still included. This is different from an entry-level objective. The professional resume profile starts with a clear career position that the applicant is targeting such as ARCHITECT or TEACHER. Do not clutter the top with a long list of potential positions you’d like. If your skills fit a wide range of positions, choose something that is a bit broader such as FINANCE PROFESSIONAL instead of listing every potential position that you could apply for. After you have stated your target goal, include a brief (3-4 sentences) of what strengths, skills, and accomplishments you bring to the table. Do NOT use this paragraph to explain what you want out of the job. Employers at the professional level want to know what you will add to their company, not the other way around. Also, avoid listing computer programs or common job responsibilities. You can highlight these either in your technical skills section. Generally, core competencies are a brief list of specific skills and keywords that future employers will want to see. Although you could probably make a very long list, limit the list to only a few. Otherwise it becomes cluttered and the details will be passed over and not read. Since the list is short, choose the ones you are particularly skilled in that will be highly sought out for the position you are targeting. Including your professional work experience goes without saying. Review the different formats to decide which layout would be best for you and then make sure to include enough information to give future employers a good idea of your capabilities while still staying brief. Typically, on a professional level resume, only degrees that you have completed or degrees with an imminent graduation date should be included. You want to show off what you have completed rather than highlight what you might be missing. Also, at the professional level, high school or equivalent education is already assumed and should not be included. Adding it implies limited professional experience and an entry-level applicant. Additional professional training should be included only if it is directly relating to your currently target position and goal. If you had previous professional training for a related field, use your best judgement to decide if it will be helpful information for the hiring manager to know. However, if the training has nothing to do with your current career goal or is outdated, consider leaving it off to allow more room for other things. Technical skills may differ from core competencies as they usually refer to specific industry software programs or technology. Similarly to the core competencies, you want to include those items that are essential or important while avoiding a long list that will undoubtedly be passed over if there are too many. Like professional training, volunteer experience should only be included if it directly relates to your targeted field or industry and if it is relatively recent. This list should also be kept to a minimum as you want your employment experience to be the bulk of your reference. At the professional level, references do not need to be included. It is assumed that you will already be bringing these to the interview and are not necessary beforehand. It is highly unlikely that any hiring manager would contact your references before meeting you in person first. Also, including them would just use up valuable space on your resume that you want to save for accomplishments, capabilities, and other important items. 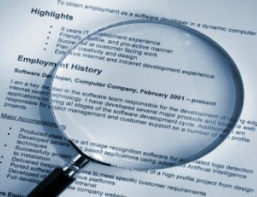 Hopefully this list will help you get started on creating your new resume. Check out our other helpful articles on resume writing to make sure that you are professional and polished.